Named for the love that you are celebrating, the Duet Collection features classic design, handmade craftsmanship, and stunning details. 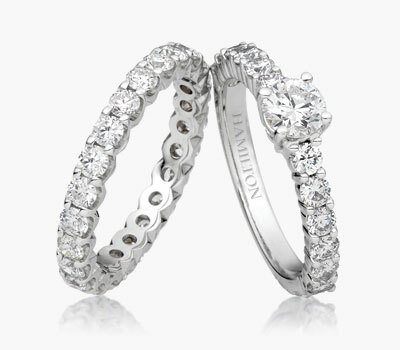 Available in single diamond centers, 3-stone, or multiple diamond band designs, crafted in 18k white gold. Start a legacy to enjoy forever. Download Our Put A Ring On It App. Try on dozens of Hamilton Jewelers style options from your mobile device! Ring Builder & Diamond Search. You found the one, now let's help you design the perfect ring.